183 pages | 64 B/W Illus. In this book, Dr. Gabow, former CEO of Denver Health of 20 years, teams up with Philip Goodman, a 34-year veteran of Denver Health who directed the Lean System group, to share their Lean journey. The Lean Prescription: Powerful Medicine for Our Ailing Healthcare System tells the story of how Dr. Gabow led Denver Health to become the first healthcare organization to be awarded the Shingo Bronze Medallion Prize for Operational Excellence. Detailing the foundational Lean principles, the bookprovides readers with the benefit of the experience of an integrated healthcare system's successful seven-year Lean journey. This book grew out Gabow’s 40 years' experience as a practicing physician, teacher, researcher, and leader of a large, urban public healthcare system. About 10 years into her 20 years as CEO of the healthcare system, she began to look at how one could actually make healthcare work right. After a year of study, she and her team concluded that Lean was exactly what healthcare needed. During the seven-year Lean journey that followed, Denver Health dramatically improved quality of care. Denver Health achieved a reduction of the expected mortality rate to the lowest among the academic health center members of the University Health System Consortium in 2011.The financial results were equally impressive. Denver Health realized almost $200 million of well-documented, hard financial benefit over seven years. This book provides authoritative guidance on how to effectively implement a Lean transformation in a healthcare system that includes hospitals, HMOs, community health centers, call centers, and paramedics. Providing an accessible explanation of the Lean philosophy and tools, the book includes helpful exercises and examples of Lean applications. The book goes beyond the hospital environment to the broader healthcare sector. In December 2015, Gabow and Goodman were awarded the Shingo Research and Professional Publication Award for the book. The Shingo Research and Professional Publication Award recognizes and promotes research and writing regarding new knowledge and understanding of lean and operational excellence. "This is a terrific book. It is engaging and should be enormously helpful to anyone wanting to improve the efficiency and functioning of a healthcare enterprise. It clearly lays out why and how to implement Lean in healthcare settings." "An inspiring book by one of the nation’s leaders in health systems change that not only chronicles one major institution’s transformation but empowers readers to follow suit." "For years, discussions of the broken US healthcare system have been long on diagnosis and short on solutions. The Lean Prescription: Powerful Medicine for Our Ailing Healthcare System aims to fix that. By mixing explanation, thought exercises, and real-life examples, Gabow and Goodman provide a thoughtful and accessible introduction to the discipline of Lean and its application within healthcare systems. By grounding the book in their real-life experience, they paint a clear and realistic picture of the commitment necessary, the enthusiasm and empowerment engendered, and the exceptional results Denver Health achieved for its patients and its staff. For any leader who’s looking for a serious approach—not a silver bullet—to making a system work better for all stakeholders, this book holds a powerful message." "The Lean Prescription: Powerful Medicine for Our Ailing Healthcare System is a prescription for excellence. It vaults to the top of the management must-read list. Patty Gabow charts a way forward for every health executive working to achieve breakthrough results for every patient." "Dr. Gabow demonstrates in The Lean Prescription: Powerful Medicine for Our Ailing Healthcare System how a CEO can change a culture and deliver massive improvement in healthcare delivery, including over $190 million in financial benefit over seven years, through disciplined Lean leadership." "Patty Gabow and Philip Goodman have succinctly captured the enormous power of Lean management as applied to healthcare. In the process they provide exercises which can deepen the reader’s grasp of concepts and tools. Notably, the accomplishments they document have been achieved in safety net institutions—a challenge and inspiration to everyone who works in such settings: even with constrained resources we can get better outcomes for our patients by systematically reducing waste and improving reliability." "Dr. Gabow’s amazing process improvements at Denver Health Medical Center were the inspiration for our own journey with Lean techniques. This book can teach specific techniques to other leaders in the medical field on how to improve their delivery of healthcare, with the focus on where it should be: on patients and their care. In these pages, Dr. Gabow has offered the great gifts of her experience and wisdom. For those with the will to improve, this book can be their guide." "If you have any responsibility for any part of the healthcare systems in the United States, your experience and the health of your patients will be better for having read, understood, and acted on the clear steps described in this unusual book. Not a treatise, it is a guidebook to take us from the jungle of cost, waste, and confusion to the clarity of efficiency and mission." "With Lean, Dr. Gabow applies a concept developed and honed in the private world to public services. Lean’s approach empowers workers to eliminate waste, improve quality, and reduce costs. We should embrace this thinking to improve the value of our public organizations." "Dr. Gabow and Phil Goodman have thoroughly captured seven years of experience in this engaging and straightforward re-telling of their highly acclaimed Lean transformation of Denver Health. All of us who know and worked closely with Patty appreciate her unparalleled attention to detail and hands-on leadership of her operations as CEO of this magnificent public hospital system. In The Lean Prescription: Powerful Medicine for Our Ailing Healthcare System that same Gabow mastery of nuances and the critical elements of transforming a large health system are factually presented, covering not just select clinical areas but the whole enterprise … as it should be done. Bravo Patty and Phil for your crisp presentation of the why, the how to, and the real results of Lean’s impact on Denver Health!" "To non-initiates, Lean can seem alternately intimidating or dull. Patty Gabow has demonstrated its power in action through the results she achieved at Denver Health. Now she has written a readable guide to Lean that will be useful for managers, providers and all who are struggling to make healthcare work. This book is a great way to dive in." "Lessons learned from implementing Lean at Denver Health are detailed in The Lean Prescription by Patricia Gabow, who served as CEO of Denver Health from 1992 to 2012, and Philip Goodman, the former director of Lean Systems Improvement at Denver Health. 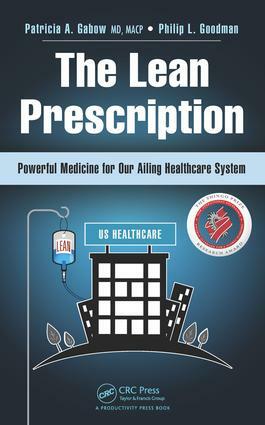 Gabow and Goodman provide an overview of the Lean philosophy and helpfully explain how it applies practically to a complex health care system, where processes and people are often siloed and wasteful practices often go unrecognized." Patricia A. Gabow, MD, MACP, was CEO of Denver Health from 1992 until her retirement in 2012, initially transforming it from a department of city government to a successful, independent governmental entity and then leading its Lean transformation. Denver Health’s Lean effort earned the Shingo Bronze Medallion for Operational Excellence, the first healthcare entity in the world to receive such recognition. Prior to becoming CEO, Dr. Gabow was a practicing nephrologist and academic researcher serving as chief of nephrology, director of medical services, and chief medical officer at Denver Health. Dr. Gabow is a member of the Medicaid and CHIP Payment and Access Commission (MACPAC), the Robert Wood Johnson Foundation Board of Trustees, the Institute of Medicine Roundtable on Value and Science Driven Health Care, the National Governors’ Association Health Advisory Board, and a senior advisor to Simpler. She is a professor of medicine at the University of Colorado School of Medicine and has authored more than 150 articles and book chapters. She earned her MD degree from the University of Pennsylvania School of Medicine. She has received numerous awards including the AMA Nathan Davis Award for Outstanding Public Servant, the National Healthcare Leadership Award, the David E. Rogers Award from the Association of American Medical Colleges (AAMC), the Health Quality Leader Award from the National Committee for Quality Assurance (NCQA), and was elected to the Association for Manufacturing Excellence for her work in bringing Lean into healthcare. Philip L. Goodman, MS, RRT, was the director of the Lean Systems Improvement Department at Denver Health, overseeing the Lean facilitators and Lean educational initiatives. In this role he led the operational aspects of the Lean transformation effort, the Black Belt training program, and the Lean Academy at Denver Health. Goodman was employed at Denver Health from 1979 until his retirement in 2013. Prior to directing the Lean Systems Improvement Department, he was the service line administrator for the Department of Medicine and director of respiratory therapy at Denver Health. Goodman is a Denver Health Master Black Belt and a registered respiratory therapist. He earned his master’s degree in healthcare administration from Regis University in Denver. Goodman has conducted numerous presentations of Denver Health’s Lean transformation effort at the national level.